Benjamin Netanyahu: Major player on the world stage? The other day I was watching the Charlie Rose show on TV, during a guest appearance by Benjamin Netanyahu. And much to my amazement, Mr. Netanyahu acted, talked and comported himself like he was the head of some huge major nation -- not just a minor Middle Eastern country smaller than New Jersey. And why not? In reality, Netanyahu really IS more important than the president of the United States or even the Queen of England. When Netanyahu asks almost every major world leader to jump, that leader rapidly answers, "How high?" What kind of Frankenstein monster have we created? 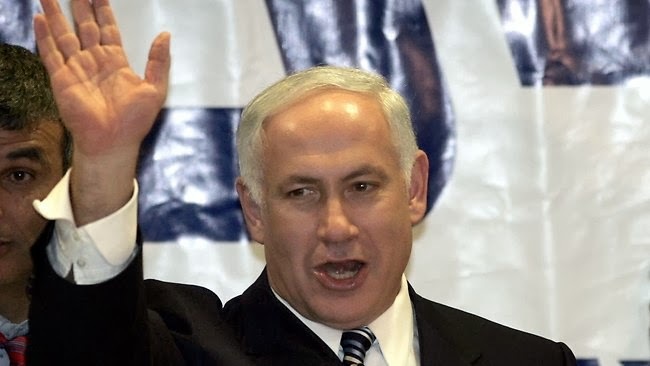 And, more important, will we mere villagers with pitchforks ever be enough to stop Netanyahu before he turns into the world's next King Richard III? Probably not. An average American, just your average man-on-the-street, knows instinctively that it is WRONG to kill people, to occupy other countries, to use chemical weapons on women and children and to use tanks, bombs and nuclear weapons to steal land from shopkeepers and farmers who cannot defend themselves. But psychopaths and major players on the world stage such as Netanyahu apparently don't get this. And, also, if you have happened to notice recently that the price of gold has gone steadily down lately, please thank a neo-con for that too. Neo-cons have worked very hard to make this happen. Why? Because if gold prices fall, this forces small investors to look around for other options for making a profit -- like investing in Wall Street's various ponzi schemes and casinos. And ponzi schemes and casinos can't make money unless they have suckers to place bets. And why would a sensible person bet on Wall Street when gold is a sure thing? PPS: New rule: Neo-cons will only be allowed to start a new war after they've finished their last one!